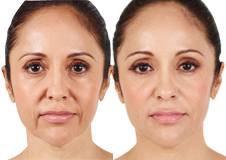 Dysport is an FDA approved injection that is administered in a short treatment which will effectively treat patients who struggle with crow’s feet, forehead lines, and brow lines. Dysport is a protein which is extracted from the bacterium Clostridium Botulinum. Rather than filling the wrinkles in the treatment area, Dysport works to stop the wrinkles by relaxing the facial muscles that cause them. The facial muscles which are treated will not be able to contract, while untreated facial muscles continue to be able to do so, so you are still able to have normal facial expressions. f you are interested in a Dysport treatment, give us a call to set up an appointment, and experience the amazing results of Dysport.